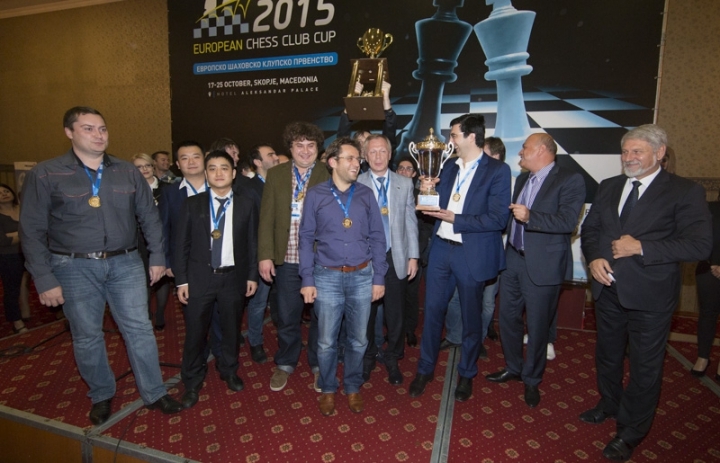 Vladimir Kramnik’s 4-game winning streak and 3102 rating performance have powered his team Siberia to victory in the 2015 European Club Cup in Skopje. Although they finished a full two points clear of favourites SOCAR (silver), Mednyi Vsadnik (bronze) and Obiettivo (close, but no cigar), their last match was a nervy encounter. Li Chao lost quickly and Alexander Grischuk was in trouble against Hikaru Nakamura, but a wild draw in that game and a clinch win for Wang Yue sealed tournament victory. 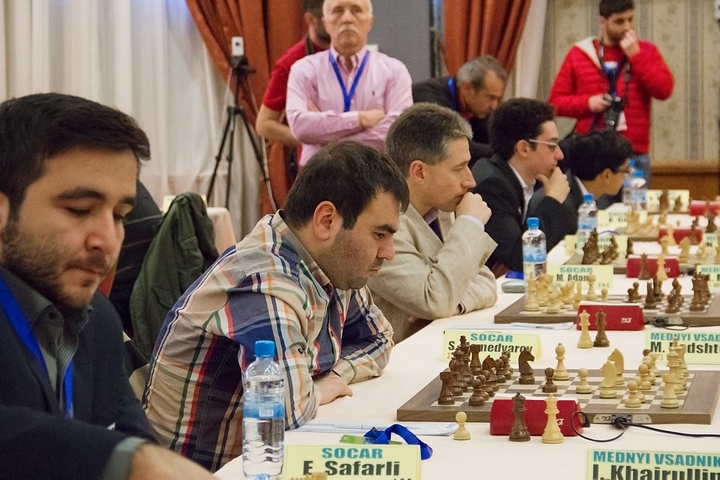 When we last reported from Skopje after Round 5 Vladimir Kramnik had just beaten Veselin Topalov to give his team a vital win over top seeds SOCAR. In Round 6 Kramnik would again score a crucial point, but for once it wasn’t about his own brilliant play. 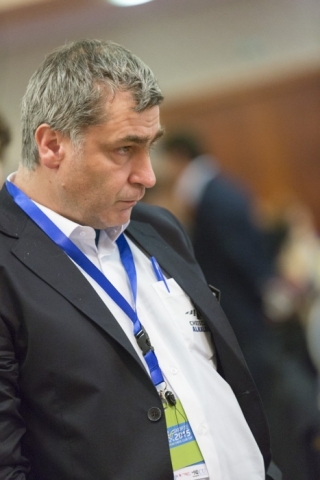 Vassily Ivanchuk has made a habit of thwarting Kramnik’s dreams. Most famously he beat the former World Champion in the final round of the 2013 London Candidates, when a draw would have seen Kramnik not Magnus Carlsen go on to play a World Championship match against Vishy Anand. In the recent World Blitz Championship Kramnik needed a win for a gold medal but only just held on for a draw that gave him bronze. 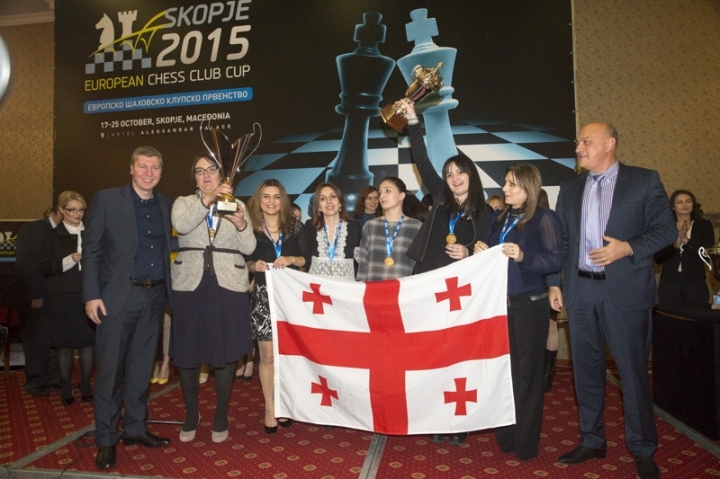 In Skopje Kramnik once again had the black pieces, and once again he ended up worse in the middlegame. On move 30 it simply looked a question of whether Kramnik could hold on a pawn down with his rooks desperately defending the d5-knight. Things changed fast, though. 31.Nxd5?! seems to have been premature, and after 31…Rdxd5 the move 32.c4? immediately left White on the defending side, with Ivanchuk losing a pawn and soon the game. He blitzed out his remaining moves so fast it was hard to avoid thinking of the way he collapsed in a rook ending where he was better against Carlsen in the World Rapid Championship in Berlin. Kramnik made no mistake hauling in the full point. That win was important, since Kramnik’s teammate Wang Yue blundered with 38…Bxa3? (38.Qxa3! would maintain the blockade of the e-pawn) and had his defences blown apart by Yuri Kryvoruchko's 40.g5! Wang Yue’s blushes were spared by his Chinese colleague Li Chao, who smoothly won an endgame against Dmitry Andreikin to give Siberia a 3.5:2.5 win and take them to a perfect 12/12 with one round to go. No less than four teams made it to 10/12 (4 wins, 1 loss), with Sergey Karjakin scoring Obiettivo’s only win against SHSM, while Veselin Topalov bounced straight back from his defeat to Kramnik to score an impressive win over Radek Wojtaszek, giving SOCAR a 3.5:2.5 victory after wins were traded on the other boards. The live rating list after Round 6 made fascinating reading. After it had seemed the time had finally come for the new generation of chess players to take over we now have two 40-year-olds and one 45-year-old in places 2-4! The sudden turnaround sees Kramnik not only ahead of Nakamura and Caruana but also Anish Giri, who lost almost 20 points to drop to 9th place and a 2778.4 rating. Does that mean Kramnik has a realistic chance of snatching Giri’s place in the 2016 Candidates Tournament based on rating? No, is the short answer. Some quick calculations (see Martin Bennedik’s spreadsheet for a running total) suggest there still needs to be a 44-point swing in Kramnik’s favour before the December FIDE rating list is published, and since Kramnik looks unlikely to play any chess in November (he’s not in the Russian European Team Championship team) that means Giri has to lose 44 points to drop to a 2734 rating. Anish will play in Bilbao and Reykjavik, so it’s not a mathematical impossibility, but you can see why Kramnik really needed Giri to make it to the final of the FIDE World Cup. Kramnik’s realistic chances now lie in a bid to hold the Candidates Tournament in Russia. …but this time the trick didn’t work. He got a comfortable but very slight advantage, and the long game that followed was more about keeping his colleagues company at the board than gaining serious winning chances. 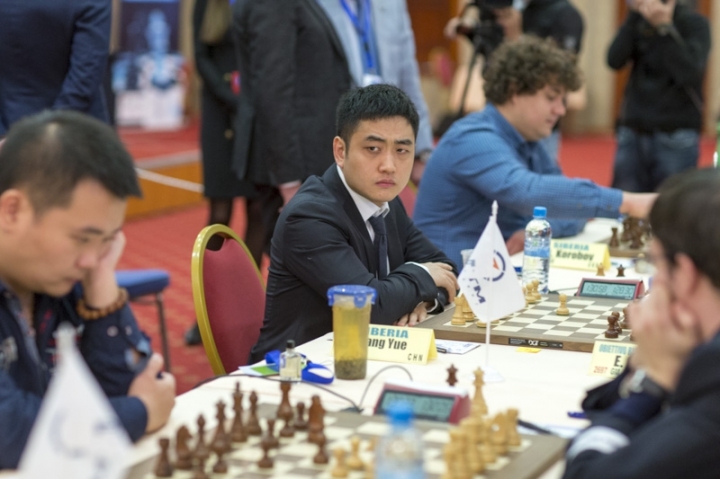 The drama took place elsewhere, with Siberia soon rocked when Li Chao chose to play a line that was universally condemned when Shakhriyar Mamedyarov tried it against Magnus Carlsen in Shamkir Chess earlier this year. IM David Martínez noted back then that 8…a5?! was a deviation from what he called “The Great Wall of China” after 8…a6. It’s unlikely Li Chao simply mixed up his moves, but in the end Maxime Vachier-Lagrave went on to win as smooth a game as Magnus had earlier this year. Siberia were in trouble, since they weren’t better on any board, and all hell was breaking lose in Grischuk-Nakamura after 22…e5! By this point Grischuk was down to around three minutes to reach the time control. Of course with an increment you might consider that his comfort zone, but it was still very clear that absolutely anything could happen, especially as Nakamura soon got down to just as little time as his opponent. So were Siberia going to lose? No! Wang Yue repeated the show of Chinese solidarity from the day before, confidently winning an endgame against Etienne Bacrot (both Chinese players won four games) to rescue a team draw. That meant Siberia would finish in clear first place, while their opponents Obiettivo ultimately dropped to fourth. The fate of silver and bronze was decided in the match-up between Peter Svidler’s Mednyi Vsadnik and Veselin Topalov’s SOCAR. Nothing was certain until Dominguez and Giri finally agreed a 74-move draw, but the real action had taken place earlier. Mickey Adams ended a brilliant event with four wins and two draws for a 2941 rating performance by smoothly outplaying Maxim Matlakov, whose position went from bad to lost in the space of only a handful of moves. That win was cancelled out by a surprise loss for Shakhriyar Mamedyarov, who survived a powerful kingside attack by Maxim Rodshtein, but couldn’t stop the Israeli player’s queenside pawns. 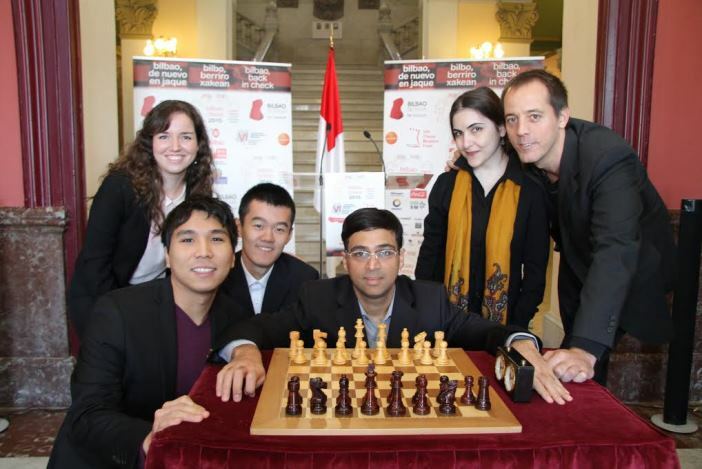 In Bilbao, Anish Giri will take on Vishy Anand, Wesley So and Ding Liren in the Bilbao Masters, which starts at 16:00 CEST on Monday. You’ll be able to follow that event live here on chess24.